NiteIze is popular for their Led dropin upgrade kit for MiniMags, the old version used 3 5mm LEDs, this new kit uses a single 1 watt LED. The IQ switch replaces the tailcap and provides a tailcap button and many new modes for your minimag. Installation of the kit is fairly simple. For the LED upgrade you replace the bulb with the led, then you also have to replace the reflector with the included new reflector, both things are very easy. The switch just replaces the tailcap. Once installed the IQ switch provides the following modes: maximum brightness (1 click), 50% brightness (2 clicks), 25% brightness (3 clicks), fast strobe (4 clicks) and slow strobe (5 clicks). The switch can also be used for momentary operation (press switch and hold,release to turn off). With the switch installed the light will turn off automatically after 15 minutes without a button pressed, this can be very good or very bad depending on your personal taste. The last interesting feature of the switch is that it has a locator red led that blinks every couple of seconds to locate the light in the dark, this is always on unless you "lock" the flashlight unscrewing the bezel partially. When the light is locked the switch does not operate. 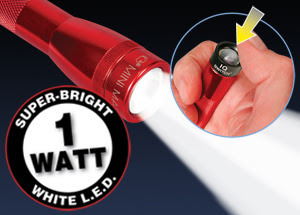 The 1 watt LED is a lot brighter than the old NiteIze upgrade kit and is also brighter than other upgrade kits we have tested, it is certainly not near the brightness of the new MiniMag Led since the new light is a 3 watt led and this one is just 1 watt. The beam can still be adjusted/focused with the light bezel. This is a good upgrade kit for a MiniMag, the LED upgrade is good and bright and the IQ switch adds some useful modes to the light. You can read more and order for $20 from Nite-Ize's website. The Night Vision line of Swiss Army watches is a flashlight-watch hybrid. The small bulge you see in the 12 position is a LED flashlight activated by the button at the left of the watch. One press of the left button illuminates the dial, a second quick press activates the frontal flashlight for 2 and a half minutes, you can turn it off pressing the button at any time, a third quick press activates a strobe mode for signaling. If you press and hold from off the flashlight will be on for 2 and a half minutes, this is called a quick search mode. Finally there is a very small red LED at the 6 o'clock marker that blinks every 10 seconds, this helps finding your watch in the dark if it is not on your wrist, or finding your wrist if you lose it. The watch has two batteries, one for the watch and another one for the flashlight so if you use the flashlight a lot your watch won't be affected. There is also a LED light for the dial and the hands are luminous. The rest is just a simple quartz movement watch with date. Water resistance is up to 3atm the band is rubber integrated to the watch dial so it may be hard to replace. You can browse SwissArmy.com or yur preferred watch dealer for different models and prices of this line.